Fortrans® designs Co2 pH-control and neutralization systems for industrial process water. Our most popular water treatment pH control systems can effectively manage up to 150,000 gallons of wastewater per day, but what if your job does not require that kind of treatment capacity? The Poli-Cut pH control system is designed for industrial use wherever high pH wastewater requires treatment and BOD or COD reduction. In order to comply with the Environmental Protection Agency and other regulatory bodies, any industry or municipality must properly treat their industrial process water. The Poli-Cut pH neutralization system is ideal for flows of 40 gallons per minute or less. Larger tanks up to 1000 gallons may be used for flows of up to 125 gallons per minute. 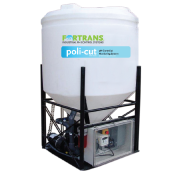 Poli-Cut combination systems may also be fitted with a Dif-Jet gas injector to feed air or pure oxygen into the wastewater being circulated in the tank to lower BOD or COD to meet discharge limits and avoid paying a surcharge to the municipality. Do you own or manage a concrete manufacturing facility? Reach out to Fortrans for additional information about our CO2 pH control and neutralization systems. Our team is available to assist you any way we can. Let’s discuss your needs today!